This is for new drivers only, with no experience, and must be taken as a 2 hour lesson. The Pass Plus scheme is aimed at helping new drivers become better drivers. We will train you and will help you to complete the six training modules required to pass the training course. Pass Plus is a training course aimed at new drivers. It was created by the Driver and Vehicle Standards Agency (DVSA) with the help of insurers and the driving instruction industry. Statistics show that a new driver is more likely to have an accident in the first two years due to lack of driving experience. Pass Plus will teach you how to anticipate, plan for and deal with all kinds of hazards, to help you become a more confident driver. For more information on Pass Plus please visit the DirectGov web site. Our Driving lessons are very flexible and can be taken to suit you, whether this means an hour at a time or 2 hours, it is entirely up to you. Driving Lessons can start and end at a destination of your choice with advance notice; this could include home, work or college. Driving Lessons can be arranged to suit you; our Driving instructors work various different hours but subject to availability. 48 hours notice of cancellation must be given or the lesson will be charged at the instructors discretion. If you need to cancel or change any driving lesson please call or text. Blocks of 10 hours must be used in 3 months. Blocks of 30 hours must be used in 6 months. 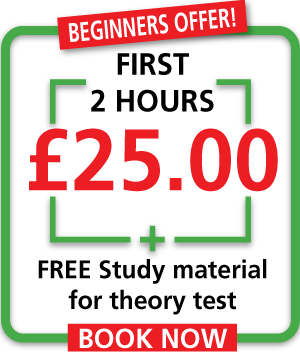 If you wish to pre-pay for any driving lessons, we must stress the agreement is with you and your driving instructor and not with the driving school itself. Gift vouchers are valid for 6 months from date purchased. The driving school cannot not be held responsible for electrical or mechanical breakdown faults occurring during any driving lesson or driving test. The driving school reserves the right to withhold its own cars if, in the opinion of the driving instructor, the pupil has not reached the required standard for a driving test. Any refunds will incur a £20.00 admin fee, this will be deducted off any refunds. We do not take cheques.